Bend sits in the high desert of Oregon, at the foothills of the eastern Cascade Range, and hovers between Ponderosa pine forest and fields of sagebrush. Known for its beer, its proximity to excellent skiing, a network of mountain bike trails, and its facilitation of an outdoorsy lifestyle, this place is also the birthplace of sport climbing in the United States. And now Bend will be the site for 2018-2019 USA Climbing Bouldering National Championships. The weekend of February 1-2 will be the open competition and February 8-10 will be the youth competition. Historically held in climbing-centric cities like Colorado Springs, Colorado and Salt Lake City, Utah, the event has traveled around the country. In 2015 and 2016 Bouldering Nationals was held in midwestern Madison, Wisconsin. For national competitions in sports managed by nation-wide organizations such as climbing or cycling, it is typical for cities to bid for two-year contracts to host these events. The benefit of hosting two-years in a row is that the effort and infrastructure put in place can be maximized over the course of a couple competitions. Although there are many climbing companies that call Bend home, such as Entre-Prises USA, which designs, manufactures and installs climbing walls and holds; Metolius Climbing, which makes a long list of climbing gear from harnesses to cams; and training facilities like Bend Rock Gym and Bend Endurance Academy, around six years ago it was the employees at Visit Bend, a private nonprofit that serves as the marketing arm for the city, that began to consider bringing the competition to town. “Our pitch was ‘let’s get back to the roots of where sport climbing started in the US.’ Although the events will be indoors and on walls created by Entre-Prises, we really emphasized coming to a community like Bend that has a deep seated climbing culture,” Kevney Dugan, the CEO of Visit Bend said. Smith Rock State Park, which lies a little over half an hour north of Bend, does seem to be the location of several climbing firsts in the United States. Climbing began in that region the 1950s, when small teams began climbing the pinnacles along the Crooked River, protecting themselves with pitons and other traditional gear. These groups were focused on summits and often placed registers with signatures of the first ascensionists atop the towers that they climbed. In 1960, the state of Oregon designated 650 acres as Smith Rock State Park in order to protect its significant geologic features and to provide a place for recreation, paving the way for continued climbing in that region. By the late 1970s, a young climber named Chris Jones began to bring bouldering to Smith. A sport already popular in Great Britan, bouldering was mostly foreign to the US. Through his focus on difficult, dynamic moves on smaller rocks, Jones established many problems and popularized bouldering as a sport unto itself rather than just a way to practice for larger peaks. Then in 1982, a 21-year-old climber by the name of Alan Watts wearied of climbing the known routes at Smith, and rappelled down faces to scope new route potential. He realized that there were enough holds on the faces to make climbing possible, but traditional protection wouldn’t work. So he began drilling protection bolts into the rock while on rappel. Watt’s climb of the bolted 5.12 route Chain Reaction is believed to be the first sport climb on record, and Watts is credited with bringing sport climbing to the USA. This new method did not come without controversy. Die-hard traditionalist climbers disparaged Watt’s new technique, claiming that it was cheating and recognizing that it damaged the stone. Today, though, sport climbing is a well-accepted and much loved genre of climbing. Now, Smith Rock, with nearly 1000 climbing routes, over 60% of which are sport climbing routes, is a popular climbing destination for Bend locals and visitors alike. Close proximity to such a historic and popular area is why numerous climbing-related businesses have made their homes in Bend. “The reason Entre-prises USA started in Bend was because the very guys developing Smith also started the company. We’re not in Bend because it is this logistical hub where it is really easy to fly in and out of or to ship goods out of, it’s because of our roots. And we are really proud to have been in Bend for 30 years,” said Sander Culliton, CEO of Entre-prises USA. 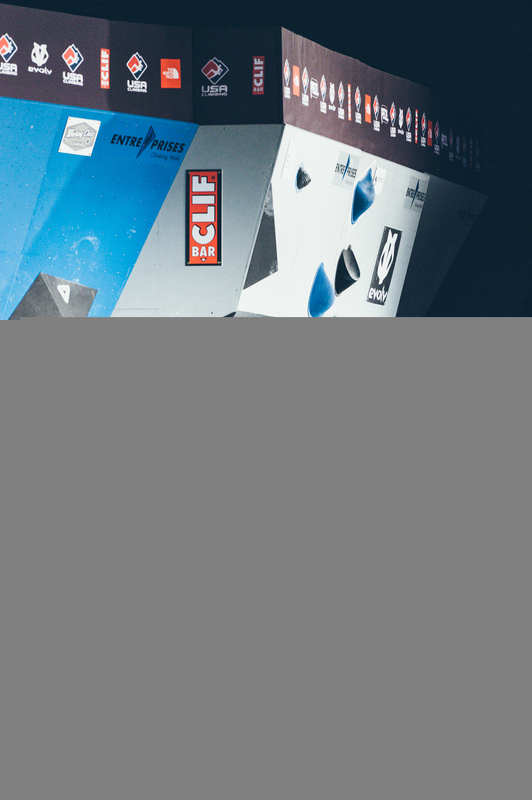 Entre-prises has already been a partner with the national organization USA Climbing for the past six years, and EP supplies the walls for all of its big bouldering events. Now the company is proud to share an event in its home town. The competitions will be held at the Expo Center in the Deschutes County Fairgrounds, where USA Climbing will install Entre-Prises bouldering walls. “There are some commercial opportunities to showcase our brand, but at its core hosting Nationals here is more about the human side of things. It is more about Bend and our people and our team. The idea is to leave visitors with the impression that Bend is a really cool town full of cool people and we made them feel really welcome,” Culliton said. Beyond the competition itself, many of the businesses in Bend are joining together to make the two weekends of the competition especially enjoyable for the approximately 3000 visitors that will be coming to town. Bend Rock Gym is hosting a citizen’s comp, the Bend Boulder Bash, for climbers who aren’t officially competing in Nationals; EP, 5.10, Bend Rock Gym, Bend Endurance Academy, and Silver Moon Brewing are bringing an after-open finals party with live music; Silver Moon Brewing will be premiering local climbing films and guest speakers to provide evening entertainment; and there will be special discounted rates for Nationals participants and spectators at Mt. Bachelor Ski Area as well as at several hotels. For two weekends this February, climbers from all over the country, even Canada, will converge and commune in Bend. Whether they are competing for a $5,000 prize purse and swag from local companies at the Bend Boulder Bash, taking a day to challenge themselves on volcanic tuff at Smith Rock State Park, or recounting competition highlights over one of Bend’s legendary local brews, these visitors will get a taste of the outdoor haven that is Bend, and will have a chance to experience the history and the climbing psyche that lives here. This story was paid for and produced by the sponsor and does not necessarily represent the views of the Climbing Business Journal editorial team.